After selling off 50 stores earlier this year and pledging to redesign the rest, West Coast grocery chain Fresh & Easy has decided to throw in the towel: after eight years in the supermarket scene, the company says it will close all 97 remaining stores, laying off all its 3,000 employees in the process. 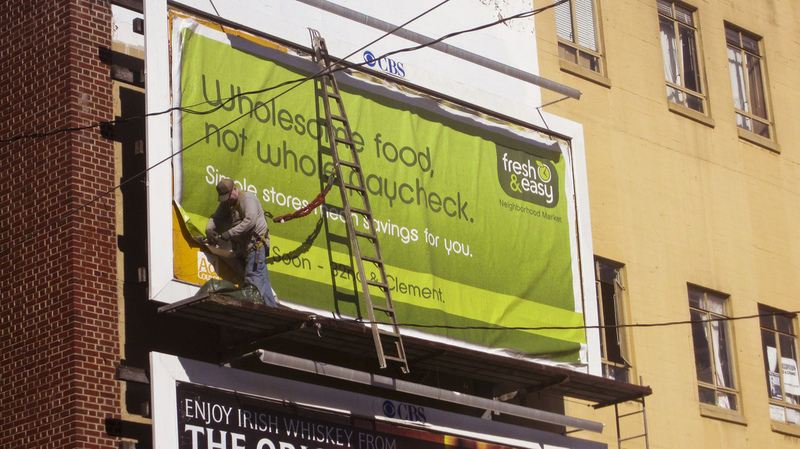 Fresh & Easy came on the scene in 2007 and tried to make its mark in the super competitive world of grocery stores, but alas, it appears to have failed. The chain will liquidate its inventories in those stores in California, Arizona and Nevada, reports the San Jose Mercury News [warning: link has video that autoplays], after already cutting in half the number of stores it had at its peak. Employees at the chain’s headquarters in Torrance, CA will be gradually let go over the next four weeks, an insider told the News. The first layoffs are expected to begin a week from Friday. Fresh & Easy previously closed its El Segundo headquarters earlier this year and moved all operations to Torrance to try to save money (it is unclear if anyone left their wallet in El Segundo). The chain started out fired up and ready to take on grocery rivals in 2007, but then lost millions of dollars when the recession hit soon after. Fresh & Easy filed for bankruptcy protection in 2013 and was bought by grocery billionaire Ron Burkle. Things didn’t quite work out the way the company wanted it to, however.